Love this bracelet.. Good quality.. 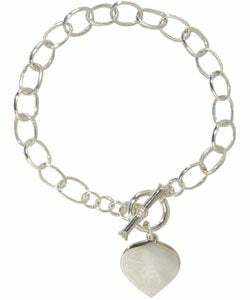 The heart tag toggle bracelet is a sure bet to win the heart of any special woman. 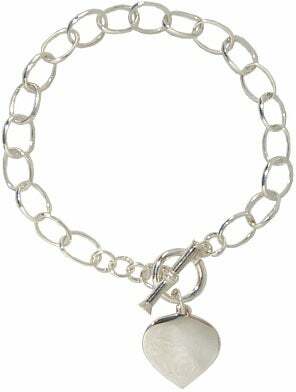 Lightweight and very fashionable, this bracelet is made of sterling silver and features a dangling heart-shaped tag, airy open links, and a chic toggle clasp. It weighs in at approximately 10.2 grams of silver. Look to Overstock.com for fantastic savings on fine jewelry and gifts. I am very pleased with this bracelet; it is well made and attractive. Sterling silver is so difficult to buy online; you cannot tell if it is going to be what you are really looking for. The last piece I bought (and returned) was a great weight but looked cheap and sounded like plastic. This bracelet is a reasonable gram weight (10) and feels solid. The fact that this is a Wounded Warrior Project product made the sale for me. I haven't taken this off since I got it. Its light and comfortable but sturdy, the toggle has never released. It could be engraved on the heart with a date or someone's name. It can be a silent tribute or with engraving one you use as a reminder to others. I would recommend it. Lovely bracelet needs the wounded warrior logo . This bracelet is much nicer than I imagined. Its comfortable and feminine. If it actually had the wounded warrior logo on the heart I would have given it 5 stars. I love this piece! And I love it more knowing it supports the men and women who have sacraficed alot to defend our country. Being a disabled vet myself, this is more than just jewelry. I'm very proud to wear this as I have been proud to serve my country as well. Thank you for supporting this program! I really love this bracelt. I still owned it and is a part of my beautiful jewelries collection. My sister even borrowed it a couple of times when she went out. I ended up buying another one for her. I would recommend this to any one. Love it and it is for a good cause. Very nice looking and not at all flimsy but it is lightweight which is perfect for me. If it had not been flawed, it would have been a nice child's bracelet capable of holding charms. For the price it was fine. Bought this for my tween niece. The picture is a little deceiving because in person it is much brighter and shinier (but not in a cheapy way). Excellent price and the quality is great. The bracelet was beautiful and it feels very nice and smooth on my wrist. I am always happy to help those who have so selflessly given their lives in service to our country and our families! I bought this for my daughter-in-law and she loved it. Mission accomplished! The bracelet was not as thick as I thought it would be and it did not stay on my wrist. I eventually lost it because of the closure. Definitely not worth the money. Very disappointing. I bought it as a gift, but had to get a different gift since I was embarrassed to give this bracelet as the gift. For my granddaughter because she's hard to please . She picked it out and i read the remarks and it sounded like a good choice. "How wide is this bracelet? Thanks!"